Precision dairy management is focused on technologies that deliver individual cow and total-herd management results to help increase dairy productivity. Precision dairying technologies reduce cost (labor, materials, fuel, processes) and increase profit. 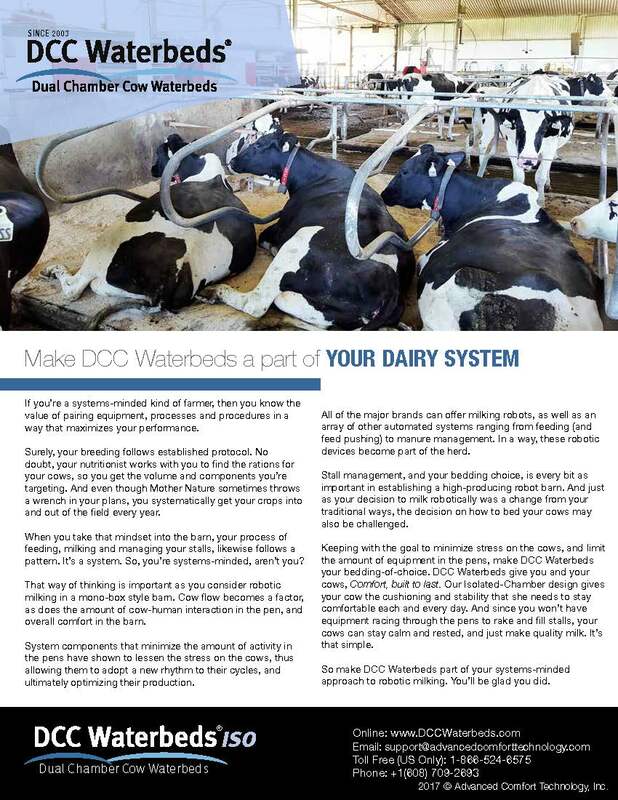 DCC Waterbeds are the ONLY bedding solution that fits within the precision dairy definition. DCC Waterbeds provide the same consistent, comfortable, dry surface every day. They do not change in their ability to provide comfort – even if your circumstances do. You may be considering a transition to robotic milking for many reasons – to reduce labor, because it’s time to upgrade, because the next generation is ready to come back to the dairy and is interested in robots – DCC Waterbeds are compatible with all of these reasons. DCC Waterbeds help reduce labor and bedding costs, are a great fit with robotic milking, and have a 15-to 20-year life expectancy. Experts agree: Dr. Wendy Fulwider, an animal care specialist, gives her thoughts on how DCC Waterbeds compare to other bedding types in their ability to provide a clean, dry, comfortable bedding solution. "Waterbeds can also provide maximum cow comfort and performance. Unlike sand, rubber mats and compost, waterbeds provide consistent support for the animal without the producer needing to top-fill additional bedding or use expensive equipment. The bed also moves with the cow’s skin, protecting her from abrasions." Sand bedding is known for requiring significant amounts of labor to maintain comfort. The constant need to add sand bedding and level stalls is not only expensive, but in a robotic milking facility, more equipment in the pen is disruptive to the cows’ natural flow. The added stress that this causes means fewer visits to the robot and ultimately lower milk production. With DCC Waterbeds, the cows are comfortable, the barn is quiet and the cows are encouraged to produce to their full potential. In addition to disrupting the cows, sand is abrasive and gets into the mechanical parts of the robotic milking system. Some robotic milking dealers have estimated that the cost of sand adds an additional $400 per robot per month in maintenance and replacement parts. Producers often turn to more frequent or larger surface areas of singeing to help reduce sand sticking to the udder, another added cost. With DCC Waterbeds, udders are clean and robots work better, longer. "If sand is the gold standard, DCC Waterbeds are the diamond standard."